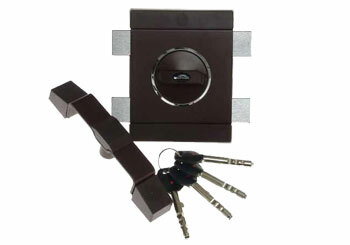 Surface locks ale basic, next to mortise locks kind of closure applied in doors and gates. Usage of surface lock increase safety level and make door or gate more break-in resistant. Through the use of surface lock room's level of safety can be easly raised. Assembly of surface lock is usually quite easy and does not require door alteration, although It have to be always checked, if the type of lock can be install in own door. 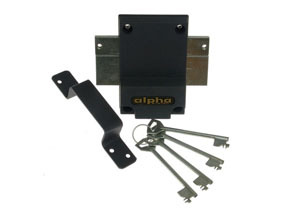 Lock from this groupe are used as protection of main door and others, from whom we require increased level of safety. 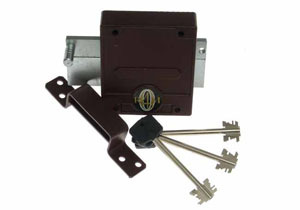 These locks are characterized by reinforced structure and solution of key and closing mechanism which impede burglary. In Poland the most popular surface lock from not certified locks group is TITAN ZX lock by Gerda Sp.z. o. o. firm, populary called GERDA lock. With TYTAN ZX lock compete puted up for sale in recent years on polish market locks: YETI LOB S.A. Firm and FANA locks 2000 and 3000 series from FANA locks factory. Locks from this group are said to be the most burglar resistant. Usually are also characterized by solid mechanical construction. It should be noticed that most of safe locks and armored cassette locks are just striker locks. 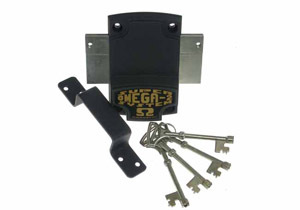 Garage locks are group of simple construction locks, made as a cylinder or striker locks. Those locks have widespread applications in rooms, of which do not require a high resistance to burglary – in utility rooms, arbors, inside garage doors etc. Surface locks can be made in various types of construction and in wide range of colors. In these varieties are certified and not cetrified locks for example GERDA type. lock with stiff blockade – lock is equipped in stiff blockade allowing for the repeal of the door and preventing the entry of undesirable persons to the accommodation. 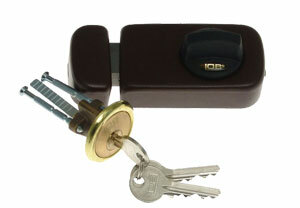 Double-cylinder lock – this type of lock prevent closing door from the inside without a key (with knob). This type of lock should be used when we want to avoid danger of closing door by unauthorized persons. 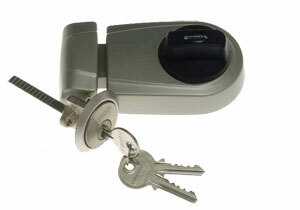 Adoption of this lock prevent opening from the inside by knob, so it should be used also in glass doors and gates. 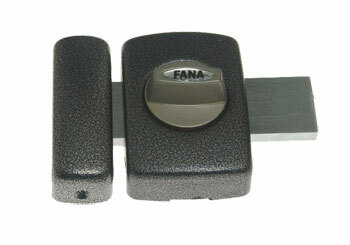 Lock without knob - this type of lock enalble closing and opening only from one side – by a key. There are applied in grilles, glass doors protection and when we want to prevent closing from the inside.